Yesterday morning, on our way home from a very interesting walk (we made a new friend! ), we were quite surprised to stumble across a Nuclear Power Facility for Ants! I figure that if Ants have the technology to build huge (relatively speaking) underground cities, then they somehow need to produce energy to fuel them, right? I was a bit nervous about giving the structures a sniff, but Elizabeth explained that there was nothing radioactive about them. 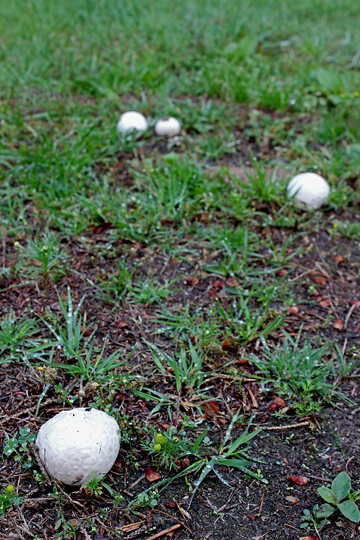 These are a type of mushroom commonly called ‘Puffballs’. Some two-leggers actually eat them! 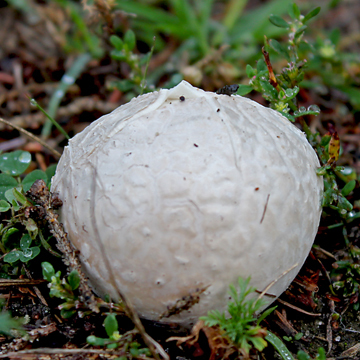 According to our research, puffballs are only edible when they are in the immature stage, like this one. We aren’t going to try them out this year. Elizabeth wants to learn more about them first. When this particular species matures (we haven’t identified it properly yet because Elizabeth is too busy getting the garden in to do all the look-ups. SIGH… Dependable help is so hard to find! 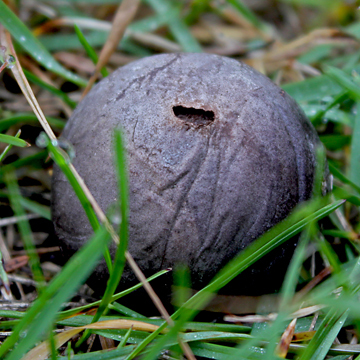 ), it turns to a brownish-grey colour and develops a little hole in the top. Elizabeth told me that when she and her brother were two-legger puppies, they would stomp on mature puffballs to release a cloud of spores. She says you have to do it just right, otherwise you just squish the globe. The sport of puffball stomping. Who knew? I would try it myself, but I’m afraid I’ll just end up having a sneezing fit. My nose is a lot closer to the ground than theirs were even back then! The first ones we found on our Sunday walk were quite strange. 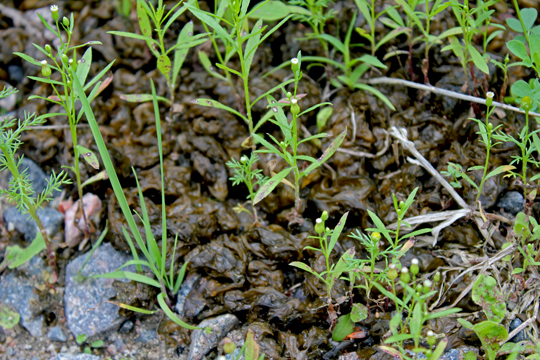 I didn’t even see them until Elizabeth noticed a bunch that I had knocked over while I trotted through a patch of Sphagnum Moss. The yellow colour caught her eye. 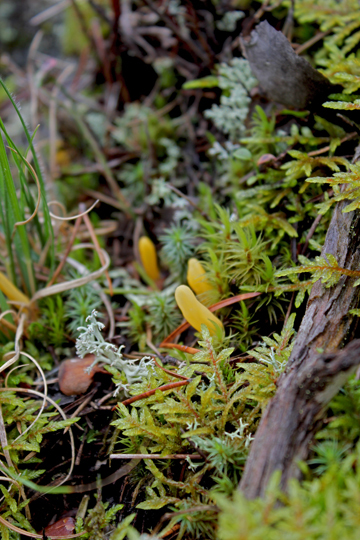 We think this is Clavulinopsis laeticolor. These are really small – the largest just two or three cm in height. Feeling that we needed to be a bit more scientific with our photos, I thought I’d leave a strand of my wool in the foreground for perspective. Then we found some little white ones nearby. 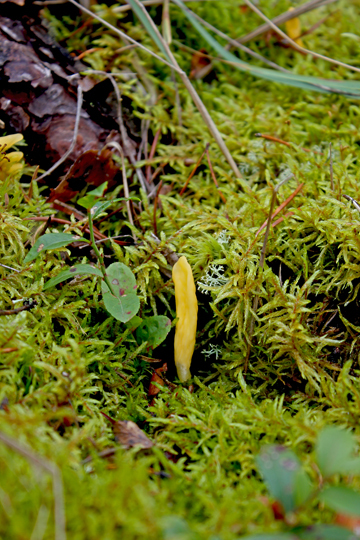 The things you begin to see when you start observing the forest floor! Don’t they look like a family heading out for a picnic on a Sunday afternoon? These were even smaller than the yellow ones! This slightly larger type looks thirsty to me. 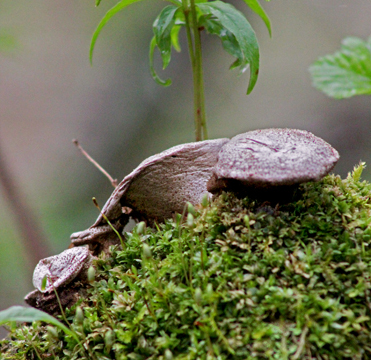 I think we’ve seen some larger mushrooms similar to this on other excursions. I wish Elizabeth knew her mushrooms better. She says one day she’ll start making a study of them… For now, she just enjoys looking. We went out on Sunday to take some wildflower pictures for you. It was a bit windy, though. 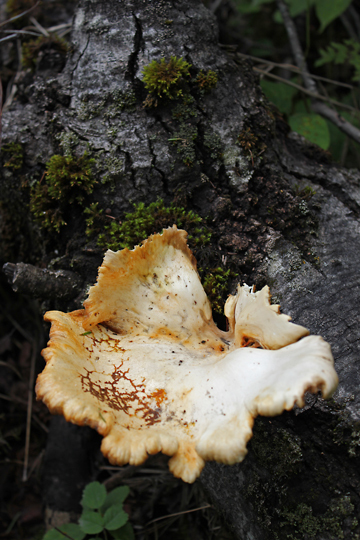 As we were walking along we found a lot of fungi springing up, including some we’ve never seen before. They are much easier to photograph because they don’t blow around in the breeze. 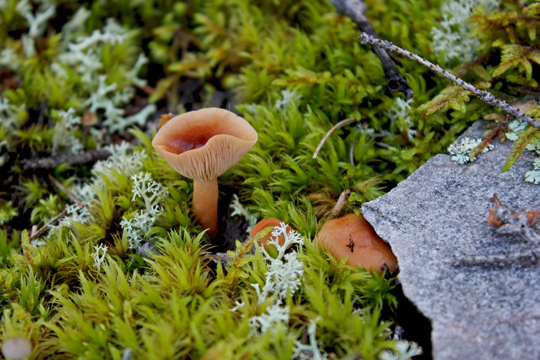 We aren’t very good at identifying fungi and mushrooms, as I’ve mentioned before, so, if you recognise some here that we haven’t found a name for, please let us know what they are! 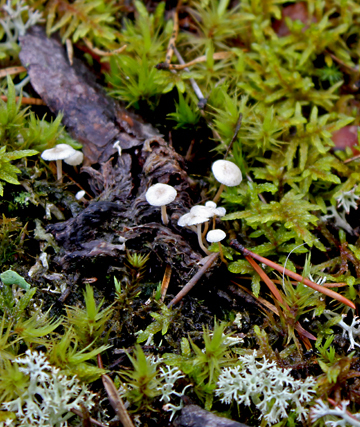 We found these tiny white mushrooms growing on a fallen tree trunk. 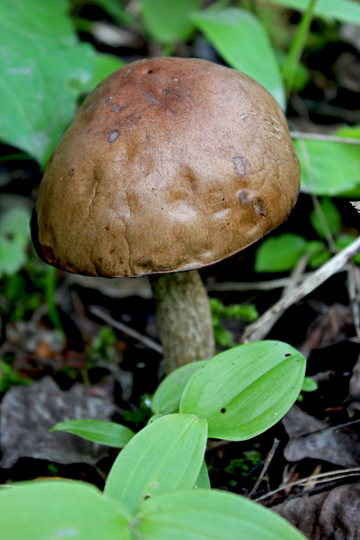 A nicely shaped brown mushroom. 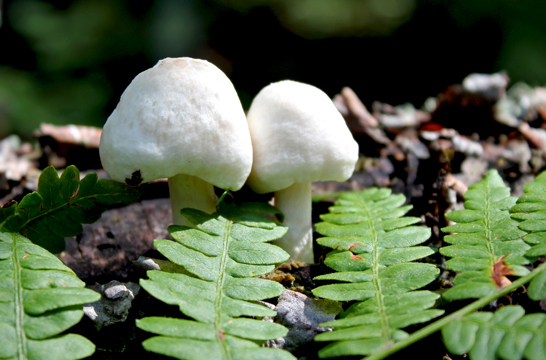 These had stems so, even though we found them on a fallen Balsam Fir trunk, we think they are mushrooms. They were very pretty – looked like they were made from felt and pasted there. 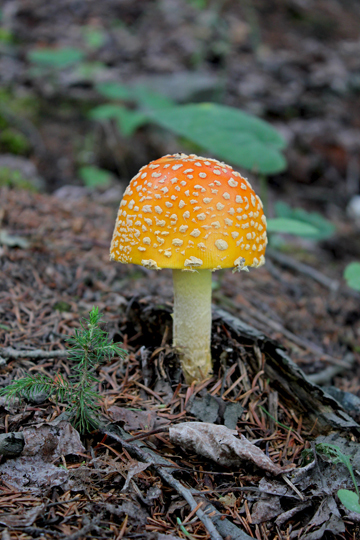 Fly Agaric – Amanita muscaria. Look at the size of it! It’s even bigger than the Balsam Fir tree growing next to it, BOL! Somebody has a big appetite! 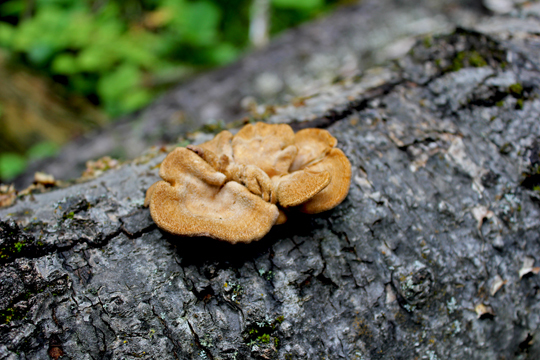 Another sort of shelf fungus, this one growing on a fallen Jack Pine. Although this looks like, well you know…, it isn’t. 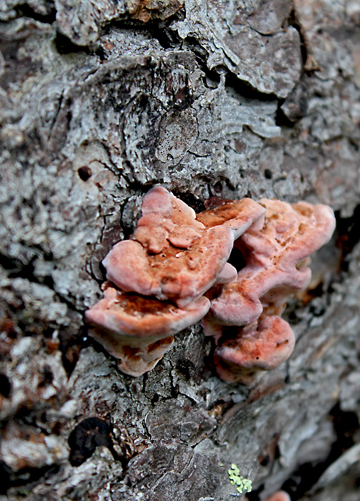 It’s some sort of fungal or mould growth we’ve never seen before. It’s growing down the middle of the Little Gravel Path for a distance covering several feet. Uuuuugly! 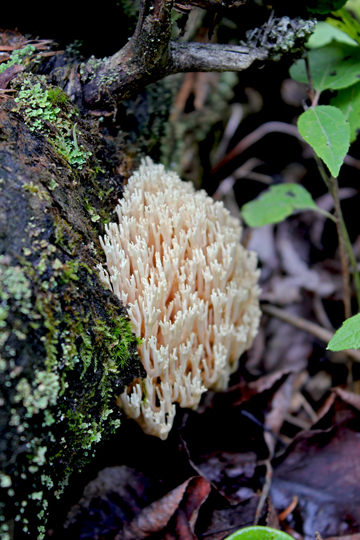 We don’t know what this beautiful one is. 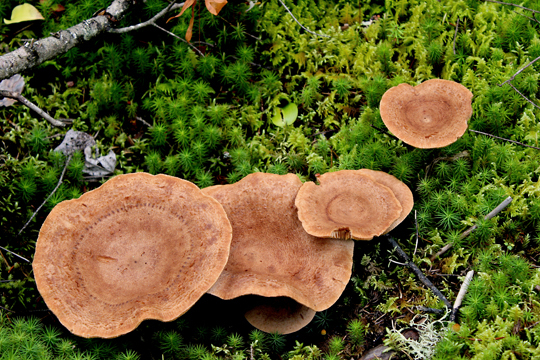 For now, we’re calling it Moose Antler Fungus for obvious reasons. 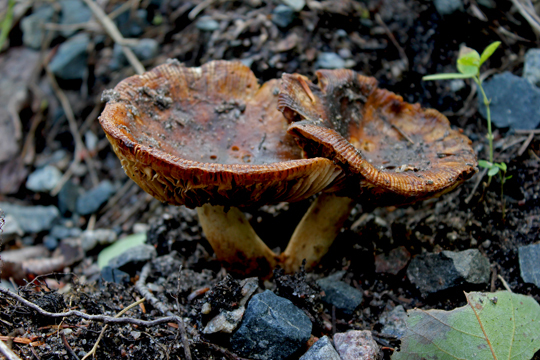 Another pair of unidentified mushrooms, suffering from their proximity to the edge of the road. 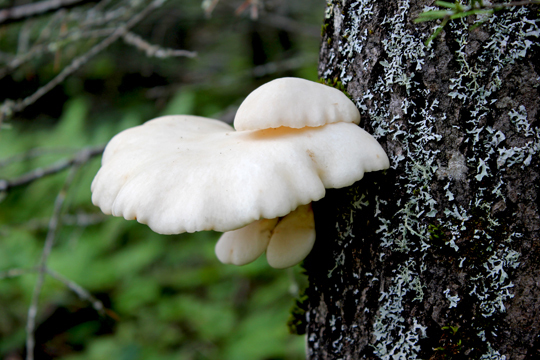 Elizabeth is very excited about this one because she thinks it’s an Oyster Mushroom – Pleurotus populinus. 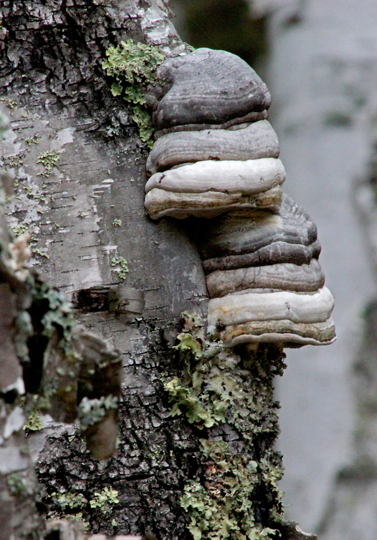 She found it growing on the trunk of a Trembling Aspen. They are supposed to be very good eating. 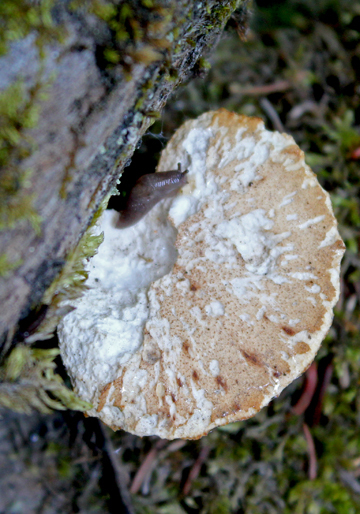 Fungi we’ve found in the woods this week. If you can help us identify them, please do! 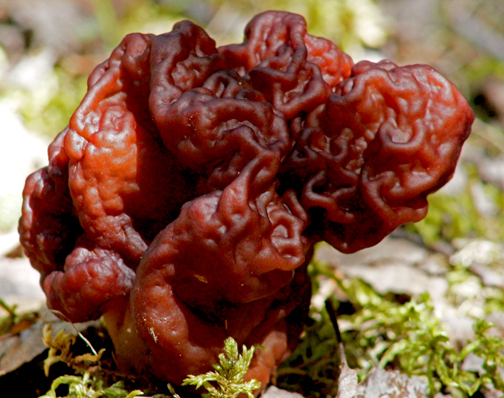 This looks like a False Morel of the Gyromitra variety, but it is hollow-stemmed. Elizabeth decided not to bring them home for supper. 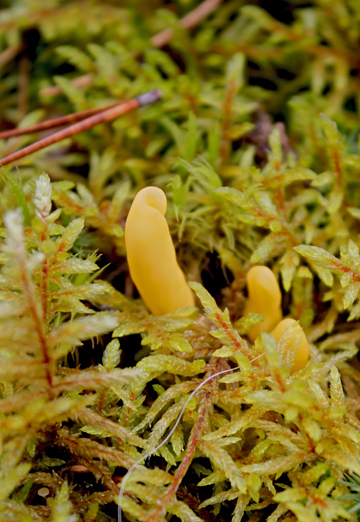 These looked like they were on a hike up an old, mossy stump. Anyone know what they are?